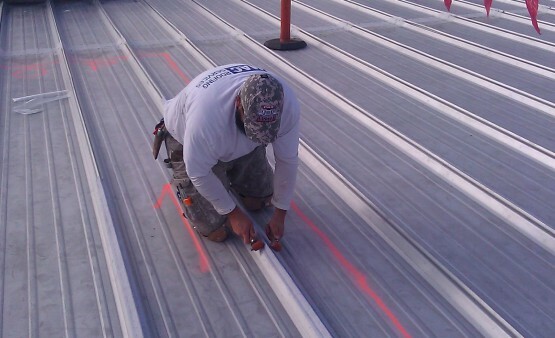 Not all coatings are created equal and as with any roof, it is the details that matter. 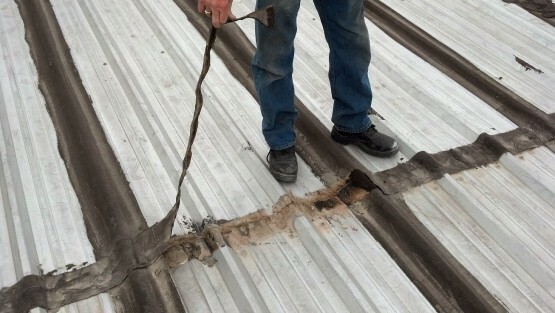 When looking at any metal roof, almost the entire leak potential is at seams, joints and at roof penetrations. The initial phase of this project requires using a polyester fabric reinforcement applied into two coats of a solvent based Uniflex Coating at all of the seams, pipes and penetrations. 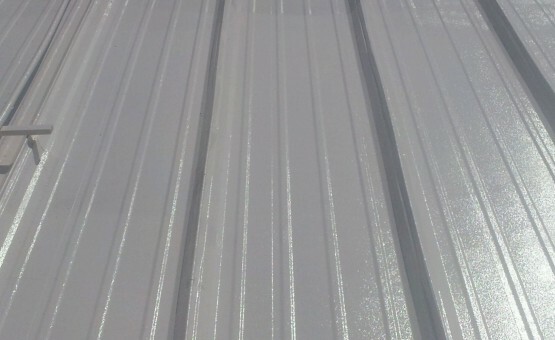 When choosing the correct coating for this, or any application, it is important for the consumer to understand that most elastomeric coatings are water based acrylic coatings and provide little protection from water intrusion. They may be a pretty white color and reflect the heat well but are intended for that purpose only. Given that they require only soap and water to clean them up, when apply that same principle to rain and potential pooling of water, you can figure it out from there. Bu using a solvent based material at the details, it eliminates the potential of rain water degrading and washing away the thickness of the coating prematurely. At completion of the potential leaking details have been repaired properly including all of the seams, the entire building can then be coated white with a much more affordable acrylic coating making this a cost effective and leak free HYBRID ROOF DESIGN. Another hybrid benefit on this and many other projects also allows us get creative at details such as the HVAC units that are roof mounted as can be seen in the fourth photo of this set. We have used spray applied poly-urethane foam to form a cricket at the rear of the HVAC unit’s plenums in order to eliminate the ponding of water at this detail. Simply by using 3 different but necessary fluid applied systems, we have custom created a roof that conforms to all of the folds and bends and details of this roof in a seamless monolithic fashion. Fluid applied roofing systems are the only seamless roof solution on the market. The added reflectivity of the coated roof has lowered the surface temperature of old steel roof by 47 degrees in the summer months reducing the radiant heat transferring into the building.